Enticing aromas of bright red fruits and delightful satsuma plum are complimented by the generous layers of juicy, ripe berries. A hint of attractive oak and soft, round tannins form the basis of this approachable and easy drinking dry wine. The winter preceding the 2017 vintage was wetter than average, which assisted in allowing the vineyards to withstand several heatwaves experienced when the grapes started ripening. The fruit produced exceptional colour and flavour with well-balanced acid and tannin profiles. Hamish approaches his winemaking as if finely tuning an engine, injecting his passion and ability to innovate after patiently allowing Mother Nature work her magic of course! Also known as 'Petite Syrah' (small Shiraz), Durif is a black skinned grape variety that thrives in the warm Australian climate producing rich and intense red wine styles. This is the perfect earthy wine for those not afraid of a bit of gusto, especially at such a pocket-friendly price! Adrian and Rebecca sourced their grapes from the warm region of the Riverina. It's rich red soils suit the Durif varietal perfectly, with warm vintage conditions producing rich berry flavours and and softer tannins than cool regions. Dark in colour, dark by nature is the ethos for Durif. This intense, dry wine wows with deep brooding fruit characters of blackberry and blueberry, teamed with subtle notes of chocolate, liquorice and balanced oak. A powerful surprise for those seeking a knock out wine any time of the week! Jen's long awaited Rebel Chardonnay returns! Delicate citrus characters will greet your nose alongside subtle toasty oak. The palate is refreshing, with peaches and cream like flavours on the mid-palate, a lovely soft texture, and a long finish. Not too heavy, and not too light - it's just right! Stepping away from the traditional big, oaky, golden 90's style, this is a crisp and refreshing new spin on Chardonnay that can be enjoyed with or without food. Jen pulled out all the stops for this Rebel - around 20% barrel fermentation gives it the extra layer of complexity and depth that is hard to find at this price! Set your summer off with a bang... this wine will wing it's way to your Angel door for under $9! A little Naked miracle thanks to you. Liz has done it again, bringing her ever-pleasing skill in blending red grapes back for all Angels to enjoy. If you're looking for an approachable, smooth drop to wind down after work, you're in the right spot. Gorgeous layers of mixed berry and spice linger on the tongue, while the softer merlot assists in smoothing out the finish. Perfect to pair with a classic family lasagne or braised beef with herb vinaigrette. The 2018 vintage brought out the best of what the Murray-Darling winemaking region has to offer - grapes full of flavour, lovingly crafted by Liz with Angels in mind. For a tiny $8.99, Angels have got a guaranteed summer BBQ buddy here! The Fiano variety is perfectly suited to the hot, dry climate of the Murray Darling where Liz sourced this wine, because it originated in similar conditions in Campania, Italy. You'll love the aromas of pear, pineapple, lemon that dance around the glass! Quince and guava flavours fill the palate and a textural element provides perfect balance leading to a savoury finish. This wine is back by popular demand! 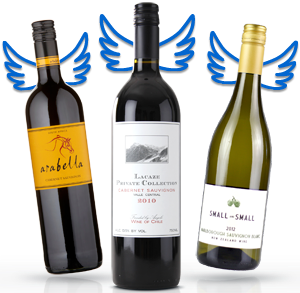 Angels will be cheering with the chance to have this stunning up & coming varietal delivered to their door for under $10. For all the Merlot lovers out there, this is a must-try! 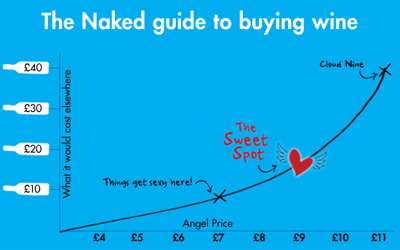 It undoubtedly punches will above it's weight - thousands of Angels buying it year in year out can't be wrong. Liz has created a balanced palate that provides the structure for a medium bodied wine. Red berry and plum layers will dance around your tongue and leave any red lover smiling from ear to ear. This wine has the capacity to be cellared for a few years, but if you can't wait (like us! ), it's perfect to enjoy now. It is delightful with most meat base meals or even on it's own. Lighter than big bold Shiraz or Cab, this is the perfect summer red!